Lychee Panacotta with Coconut and Ginger!! Pana cotta actually is an Italian dessert made with a cream as a key ingredient, hence the translation of the words which mean “cooked cream.” Although not all recipes for panna cotta actually require cooked cream, the traditional recipe makes a light, smooth, eggless custard, flavored with caramel, vanilla or cinnamon. This version is a little different, which includes Lychees, Coconut cream and Ginger!!! Soak Gelatin in cold water to soften and keep aside. Take cream, coconut cream, sugar, ginger in a heavy saucepan and bring to light simmer, just till boiling for 10 mins. 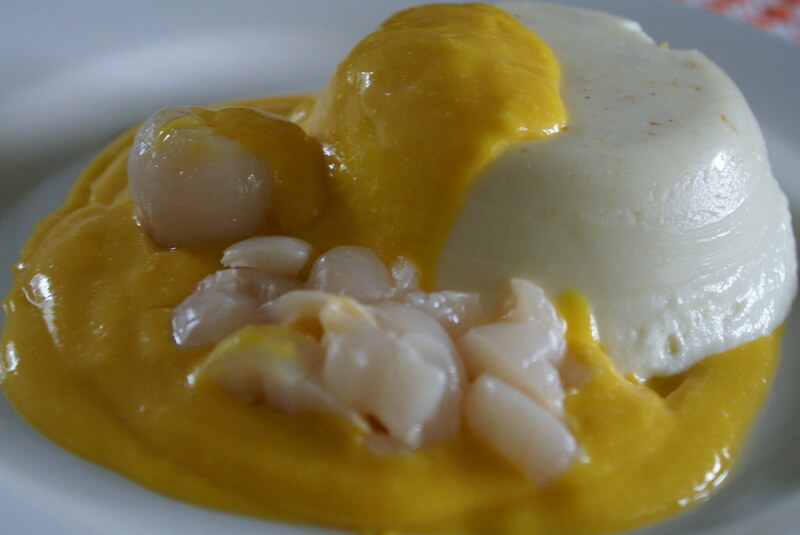 Remove from heat and add the Lychee puree and vanilla. Squeeze the excess water out of the gelatin and stir into the hot cream. Allow the cream to cool completely. Fold in the semi whipped cream and pour the mixture into moulds. Cover with plastic wrap and refrigerate till fully set. To serve, carefully pass a knife through the edges of the mould, and place the mould in warm water for few mins and then invert on to the serving plate. Utterly delicious.. what more can it be when two exotic fruits come together? This is my entry for the Lychee – AFAM event being hosted by Sig of Live To Eat. Wow Cinnamon – your pannacotta looks really good. I love pannacotta but have had it only with a strawberry puree so far.. this combination of mangoes, lychees and ginger is truly exotic. That pic is absolutely fabulous! 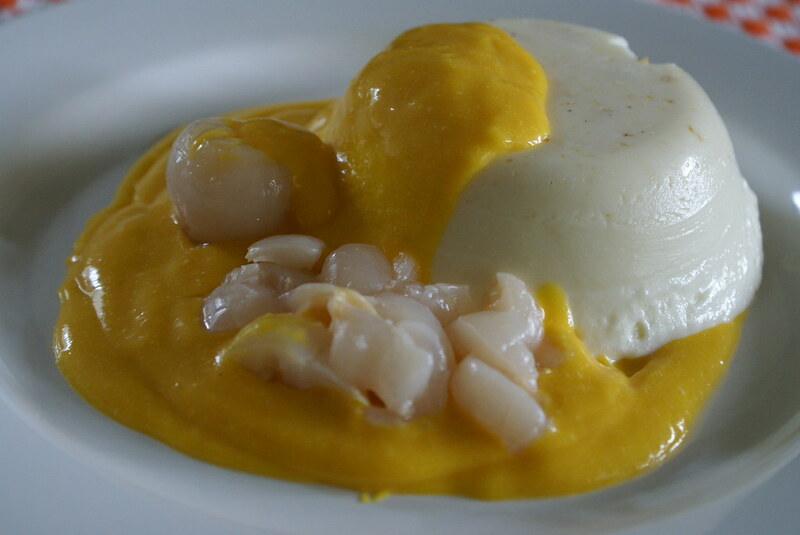 And to serve with Mango puree, pure heaven. While i am writting this i am drooling. wowww looks awesome…I love panacotta’s.Lovely entry. Wow! looks amazing cinnamon. Completely new recipe. Great recipe. Thanks for sharing. ohhhhh that looks divine!! can i take a dip? lovely and delicious looking!! Wow..that looks awesome, such a nice innovation, never tried this before, yours impulsing me to try it! Great entry…. Why dint I think of this. Lychee is already custardy. Great idea! wow, this sounds just wonderful!!! I love the combination! Whoa!!! Panacotta.. that too with Lychee? Super entry… love it..
hey nice entry dear.i never thought of it.good going. SLURP!!!! Can have it off the pic! 🙂 I love all panacotta’s and this is another one to try! wow! this is really innovative 🙂 love the unique mix of flavours. Asha, Richa, Thank You Girls!! Seec, Mythili, Maninas, Thank You ! Coffee…if u r a pana cotta fav, then this is a must try! Nags, ya the mix of flavours is what makes it different! this will warm sig’s heart. she’s the panacotta queen. youor dish is beautiful. wow looks so yummy, luv it so refreshing. Sounds cool, tho’ I can’t see the pictures. Lychee n ginger is definetely an excellent combo …..have tried tht one ….n adding coconut …..yummmm ….i can imagine how creamy n delicious this will turn out ….yum …yum..